Have you ever seen ads for cheaper off-brand printer ink and wondered if you should try it out? If you are like me you have, but always chickened out. What if the ink is junk, or worse yet messes up my printer? As a result of that fear, I have always scurried back to the safety of the Canon ink (since I have a Canon printer). At the same time, if you are like me, you choke at the insanely high prices of printer ink. It is so expensive that I actually avoid printing sometimes. The ink for my printer comes in 8 different colors and each one costs about $15. You can get boxes with multiple cartridges that bring the cost down to about $10 per color. A full set of ink off all eight colors will set you back $82 on Amazon . Despite the high price, I have always just sucked it up and bought the Canon ink. This week, however, I saw a deal I could not pass up. I went online to order some Canon ink off Amazon and noticed that a company called Blake Printing Supply was selling 24 cartridges of ink for my printer for only $36 . That’s insanely cheap compared to the Canon price! I could get 24 cartridges about the same price as just 2 cartridges from Canon. Plus this product had 165 reviews with an average rating of 4 1/2 stars. Most reviews said the ink was great and they could not tell the difference between it and the Canon ink. I had to try out. So I ordered it. All this ink for $35. I couldn’t pass it up. But is it any good? A day later my ink arrived. In the meantime, I had an idea. I would use the remainder of my Canon inks to make a series of prints. I would then make the exact same prints with my new ink and compare them. It is one thing to think prints from different ink look the same – it is another to know based on a side by side comparison of the same prints. That was the idea anyway. Why should you care about this? A few of you reading this might actually benefit from the same deal as me. But even if you use a completely different printer with different ink, the experience of trying out the cheap off-brand ink ought to be illustrative to you. I’m sure there are cheaper inks for your printer that you might want to try. I picked out four different photos from a trip to Paris earlier this year. I made all the prints as 8 x 10 inch prints on the exact same paper. After that, I took a picture of the two prints sitting side by side. The results for each of the photos is below. 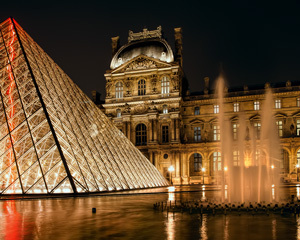 First, here is a photo of the Louvre taken at night. The original digital file is to my left and scans of the two prints are below. The photo on the left used the Blake inks, and the one on the right used the Canon inks. I give the nod to the Canon ink in this comparison. The color in the print using the Canon ink looks a little more like the original. So far, the Canon ink is faring better. Next, here is a photo taken inside Opera Garnier. Again, the original digital file is to the left, and scans of the prints are below. The photo on the left used the Canon inks, and the one on the right used the Blake inks. I think the print using the Blake inks looks better in this comparison. The colors of the Blake inks look more like the original. I find it odd that in the previous picture the Canon tones looked warmer, while in this example the Blake tones look warmer, but that is how it worked out. At this point, each set of inks looks better in one picture, so I’m feeling pretty good about the Blake inks. Here is a photo taken in Galleries Lafayette. The print on the left used the Blake inks, while the one of the right used the Canon inks. These are very close. You might even call them a draw. If anything, I would give a slight advantage to the print using the Blake inks because the color looks a tiny bit richer and more like the original. But it is very close. At this point, I am leaning toward Blake. Here is a photo taken outside Fouquet’s (a restaurant) on the Champs Elysees. The picture on the left used the Blake inks, and the one on the right used the Canon inks. The color and brightness values look the same to me, so I’m calling it a tie. As a result of these four comparisons, I score this as 1 for Canon, 1 for Blake, and 2 ties. To me, given the vast price difference, that means I’m really liking the Blake inks here. I’m interested if you would score it the same way, so if you think differently just let me know or speak up in the comments. So far, to me at least, the cheap off-brand inks look at least as good as the Canon inks! Obviously, this is a huge problem, and both of these prints are ruined. It only happened in the last two prints I made with the Blake’s ink. I know from previous experience that this is caused by clogging of the printer heads. It happened to me once before (using only Canon inks). Simply running the cleaning program in the printer software solved the problem when I originally encountered the problem. I just ran that program again, and it solved the problem. I have since made several sizable prints using the Blake inks and had no reoccurrence of the problem. Is this an example of the Blake inks clogging my printer heads? Well, it certainly appeared so when I first saw the problem. It happened only 3 prints into this experiment using Blake inks, and that would be quite a coincidence if it wasn’t related to the change in inks. On the other hand, this problem has happened before (when I was only using Canon inks) and in any event has not returned, so I cannot swear it was due to the Blake inks. It is something I’m keeping my eye on though. Ok, I have to tell you – this is a game changer for me. As of right now, I will continue to buy cheap off-brand printer ink. The cost difference is huge and the quality difference appears slight. This has opened up printing for me. I’m making prints all the time. If I don’t like them I throw them away and make new ones. I never would have done that previously. But what if a client wanted a print and it needed to look perfect and it needed to last a long time? What would I do then? I have to tell you I don’t have the comfort level with the cheaper inks for that yet. But I might develop it over time. We’ll see. Testing the Online Photo Labs (Video) Finding the Best Online Printing Lab The Complete Step by Step Process for Making a Print Using Lightroom A Simple and Cheap Backup Strategy Should You Turn Off Image Stabilization When Using a Tripod?